The Sunrise Pool Deck at the Modern Honolulu. In every room and suite you can expect a décor focused on white and neutral hues coupled with sleek design, magnifying those Pacific Ocean views and the Waikiki skyline. Better still; every element is original or custom-designed such as the sculpture of broken-in-action surfboards behind the lobby desk or the hotel bar hidden behind a revolving bookcase, adding to the overall vibe of fun-in-the sun meets contemporary style. The Modern Honolulu boasts an ideal central location where guests can indulge in all that Oahu has to offer within minutes – luxury shopping, beaches, and nature. Nearby are breathtaking hikes to the top of Diamondhead, through botanical gardens to Waimea Falls or around the cliffs at Hanauma Bay. For the more adventurous, contact the concierge to arrange skydiving, a shark tour or surfing lessons. Whether you are looking for casual beach-going attire or high-end chic, Waikiki shopping is not to be. Happily, The Modern is merely steps away from the high-end shops along Kalakaua Avenue and minutes from Waikele Premium Outlets, so a spot of retail therapy is never far away. The Honolulu Spa at The Modern is an indulgent oasis where you can lap up treatments developed around the purest and most exclusive products in the world – think natural, organic, hand-crafted and sustainable goodness. At the spa you can also tailor massages to oils and scents you like; lavender, lemongrass and even good old Aussie eucalyptus are on the menu. Iron Chef Masaharu Morimoto (yes, the Iron Chef) plates international fare at Morimoto Waikiki, located at the hotel. The restaurant’s open kitchen and full sushi bar seamlessly integrate Japanese and island-grown ingredients. The hotel’s culinary team also delivers organic, local and house-made choices for poolside and in-room dining. 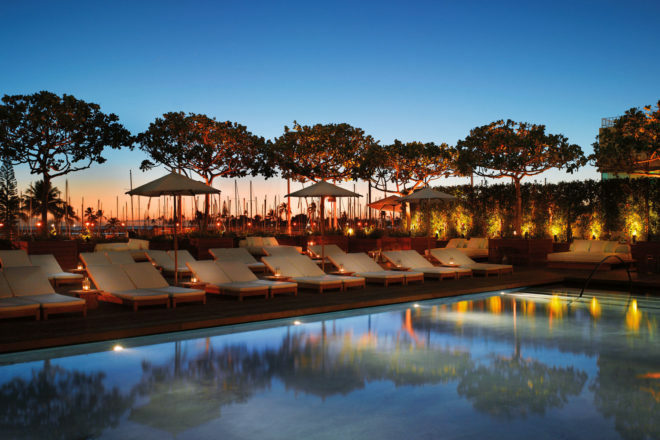 Two stylish pools overlook the Pacific for daytime fun. At the heart of the hotel is the see-and-be-seen Sunrise Pool deck. The Sunset Pool however is an adults-only affair where grown-ups can unwind and cool down, away from youngsters. It’s also worth a chill-out in one of the nearby hammocks, surrounded by sand and palm trees with a sparkling view over the marina. At 5pm each evening, a wall of books rotate to reveal The Modern’s lobby bar, which anything but a standard lobby bar. Known as The Study, here local, original musicians provide nightly entertainment. Or if you care to pick up the pace, Thursday through Saturday is when the hotel’s vibrant Addiction Nightclub really gets pumping, and when many a celebrity or socialite can be spotted. The Modern isn’t all elaborate cocktails and celebrity spotting. There are also some thoughtful touches that really amp up the guest experience. Little extras like complimentary tea and coffee in the foyer each morning, like refreshing tubs of mango or lemon sorbet handed out for free around the pool during the day, and the fact that the pool area itself is open for 24 hours. Better still, The Modern Honolulu website regularly offer accommodation packages and credit to use on hotel services like breakfasts.